As ConnectiCon and what I refer to as “con season” comes upon us, a lot of us might be struggling to style a wig into what we had envisioned or, to even find a good place to buy a wig. Never fear, because I am here to help! Unfortunately, I have already styled all my wigs so, the pictures are at a minimum for the actual process but, lets start with where to buy from. Now, you can find sites or even stores that have quality wigs but, as for me, I trust Arda Wigs; they haven’t steered me wrong yet. 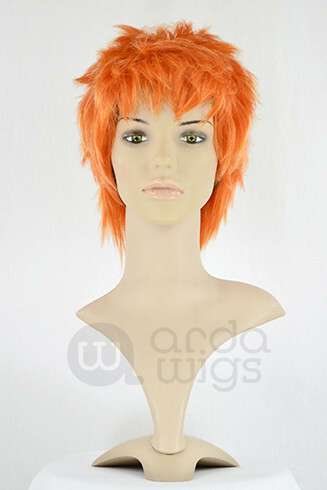 Their wigs are high quality and more importantly, heat resistant. This means that you can take a flat iron or a blow dryer to it and it functions in the way that real hair would. I have been told though (granted by a rival wig company) that the longer styles in Arda Wigs aren’t that great but, I can’t confirm or deny this since all the characters I’ve done have fairly short hair. 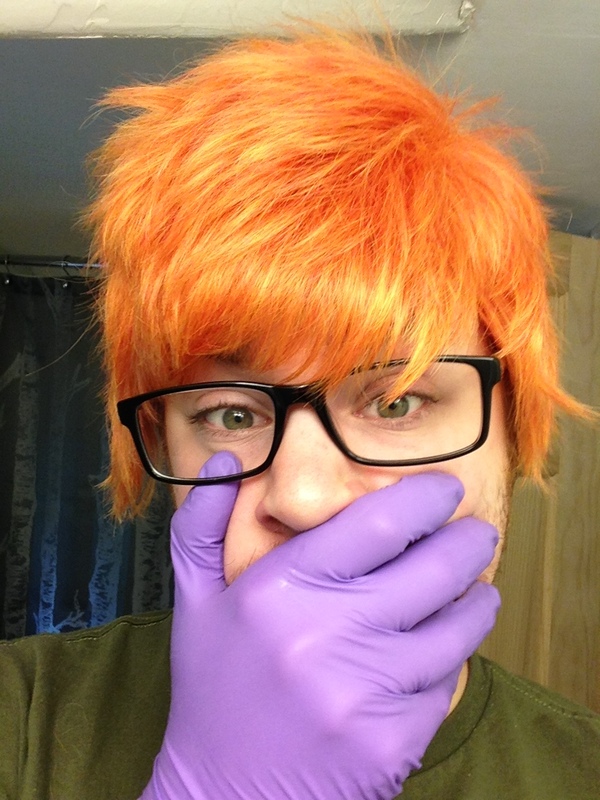 A wig for a Dexter’s Lab cosplay before styling. As for styling, something like the wigs I have styled is easily achievable with a blow dryer and some hair spray! 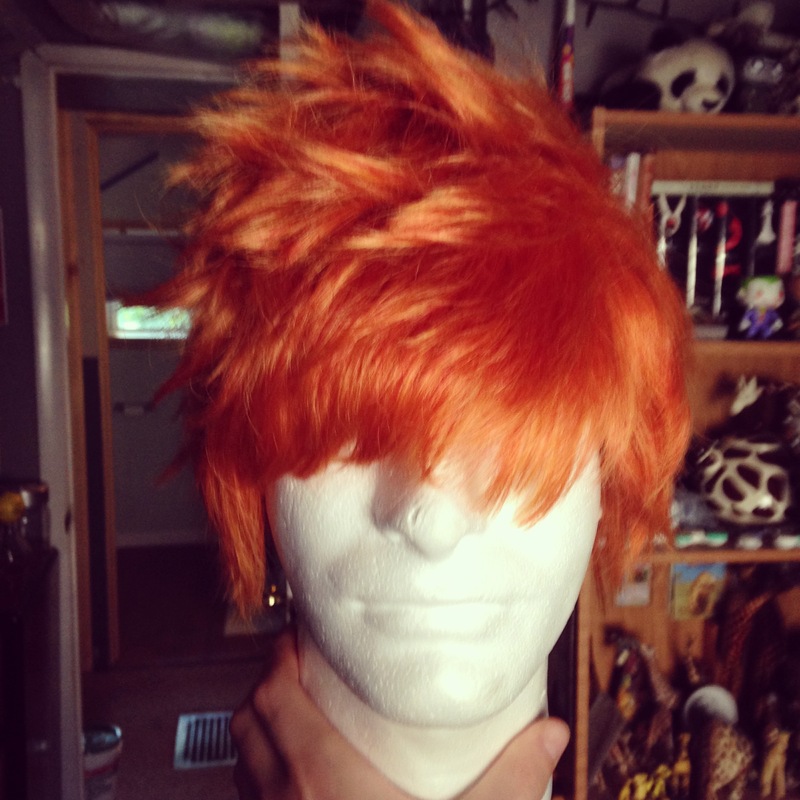 for the spikes, I just blow upwards to give the wig some lift and then use a little hair spray. Then, to lift the spikes, I take little sections of hair and twist them while I lift them with low heat on the hair dryer. When I’ve got the spike in place where I’d like it, I hit it with some more hair spray while I hold it and continue holding until it is mostly dry. Yes, your hands might get messy but, it will wash off easily. The same wig after styling. I decided Dexter had grown up and chnged his style a bit. You might want to buy a foam wig head both for styling it off of your own head and also for the purposes of storing your completed wig without sacrificing your hard work. You can buy one for around $10 at a craft store like JoAnn’s or Hobby Lobby. Other supplies I mentioned like hair spray are obviously available all over the place but, I use Tresemme Firm Control Spray. If you happen to make a mistake, no worries! Wigs of high quality are easily washable if done correctly and you can just start again.